So I've got Frances Allford's article in the latest Quilting Arts, on monoprinting fabric with fabric paints on a gelatin plate; and I've got a book about monoprinting paper with water-based inks on a gelatin plate. The only thing is, I want to print fabric with the kind of multi-layered, dreamy images shown in the book on paper. 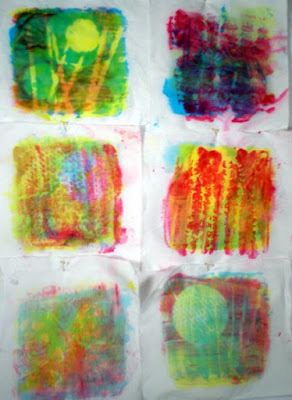 These are what I got from two weekends' experimenting with thickened dyes on gelatin. The first weekend's work was so pale it washed out. The second time I mixed really strong dyes and the color was so strong I could hardly see what I was doing; when half of that washed out, I was left with these results. Part of the problem seems to be that the dyes sink into the gelatin; my gelatin printing plate was totally saturated with color by the end of each day. I suppose it's time to get on the dyers' list and ask if anyone has had better results with this method, or suggestions as to how to get the dye onto the fabric rather than into the gelatin. I finished this piece just before we left for Nova Scotia, but didn't have time to photograph it until this weekend. It's built to showcase the round bead dangling at the bottom, a true masterwork combining raku with PMC which I bought at a bead show a couple of years ago. 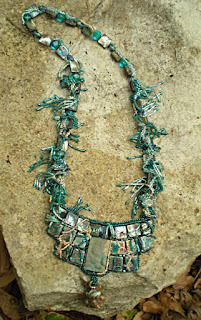 The large rectangular bead just above it is titanium-sprayed drusy quartz, and the tiles on either side are raku beads in green and copper (bottom rows) and abalone squares (top row). The fringe on the neck strap took forever to do. 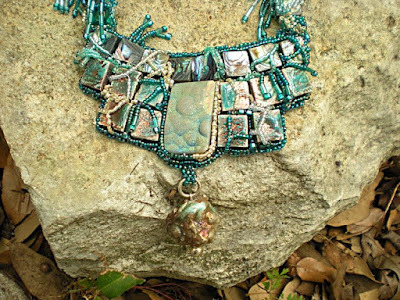 At least I didn't have to bother with a clasp; this one is a keeper which I will never ever sell, and I don't like clasps because they get caught in my back hair, so the strap is one continuous piece of free peyote from one side of the front piece to the other. With, as I said, lots of fringe. Possibly a little too much fringe - it certainly felt like that when I was working on it!